Back in the 2000s, Anna Sui makeup was such a treat and treasure for me (with a part-time and minimum wage job and all) and it's sad to see that the brand no longer gives me that kind of surprise and delight. I wonder if it was my higher purchasing power that made these no longer desirable (for the price of 2 Japanese luxury brand palettes, I could get bag-full of little toys. It almost felt like pastry hoarding at Chinatown, two blocks away from their Soho store). After trying all of toys, I have concluded that it wasn't me, it was them. 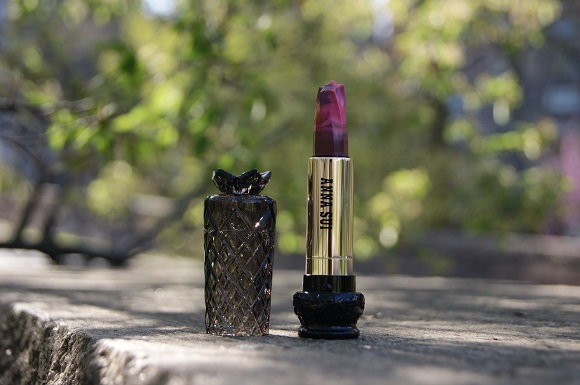 Anna Sui Marbleized lipstick is a "new" formula that came out with their most recent lipstick design. Ever since their epic fail of a revamp in 2010, the brand had been doing packaging overhaul every two years or so. The clunky geometric design is same across different formula, but instead of a light gray cap, this one is in a darker shade of clear black. Quality of plastic is high as it feels substantial and produces a crisp click. 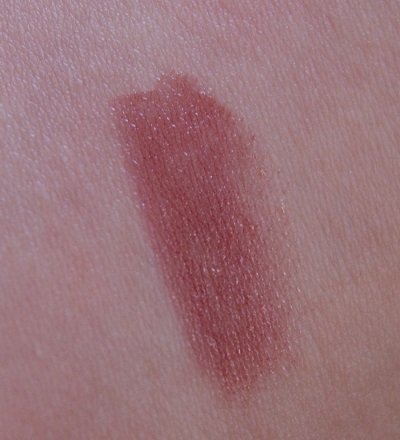 371 is a dirty vamp with a bit of brown, taupe and berry mixed in. It's very similar, if not identical to Anna Sui's old Rouge G (for gloss) I owned (no link to old picture because the 7-year-old posts had ugly pictures oh and lip line galore). The formula of this is identical to Anna Sui Rouge G (second generation of packaging) as well, it's a light cream gel formula that's comfortable and glossy. I like that formula so technically I shouldn't complain. Then it just occurred to me: The brand (Albion) never bothered with developing new texture/formula, kept using the old one that was around for 10+ years. I was hoping more people would hate it and they switch packaging again this fall...If they end up with black and gold theme that can't be good either. Anyway, to think of it...Their Gothic coffins tube from 2010 don't look that bad now. I'm annoyed. A stressful day at work calls for some retail therapy at the makeup counters. I work in a large shopping centre which explains why I have gone off the rails. I bought another pretty pink lipstick. Estee lauder pure color envy hi lustre lipstick in sheer sin 220. A nice pretty pink....but so much shimmer and it stains my lips into a purple pink color as the day wears on. I'm so bummed. I don't normally touch Estee lauder as I know it's just a high end version of MAC cosmetics. I just paid off my credit card and now I have to pay off this sucker and plus I got more bills coming up. Now it's just going to rot away in my makeup shoebox graveyard along with the other duds. I'm waiting for the Dior lacquer sticks to come out, I'm eyeing tease 550, a pretty warm pink. I have a graveyard for those as well (I call them Cold Palace...as most lipsticks are like my concubines). Just yesterday, I separated those midrange to highend that I don't feel like touching for the second time. Anyway, now I am rethinking about all the retail therapy lipsticks I have...They are inducing some headache as well. I change my mind about the Estee Lauder lipstick, i kinda of like it now that i've worn it more. Face palm. They are a bit dry compared to the Dior Addict Lipsticks but they last a lot longer. I guess like you said, i'll take it out of the cold palace and make it one of my precious consorts lolz. I'm going to head back to the EL counter when i work next time to check out more shades. I'm eyeing Crystal Baby, a warm peachy coral pink and Impulsive from the original Pure Envy Sculpting line. Well, lucky for Estee! If I work near a department store I will burn through lunch money much quicker. But I imagine it would be so cool just swatch the half-hour break away (lighting will be perfect too).